Yes it is a soft cherry as are most cherries. 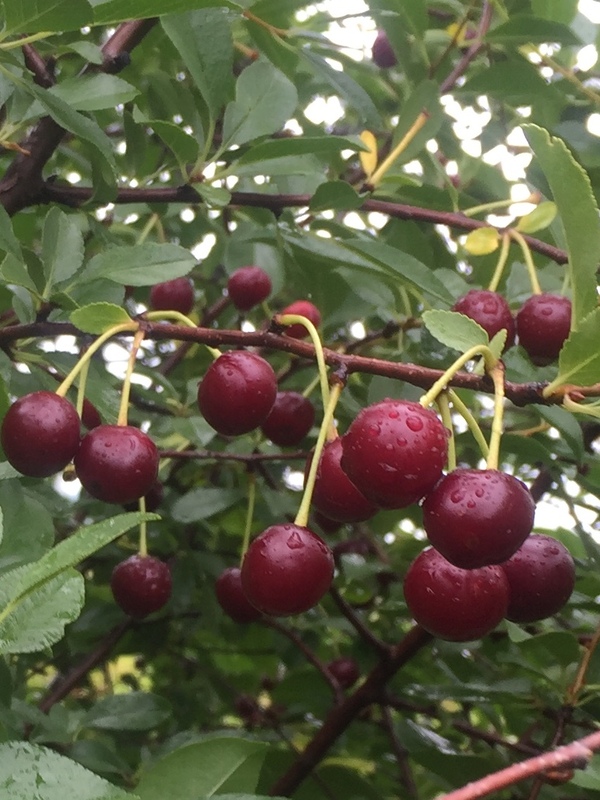 There are a few sweet cherries that are firm eg. bing but many of those sweet cherries are semi soft. 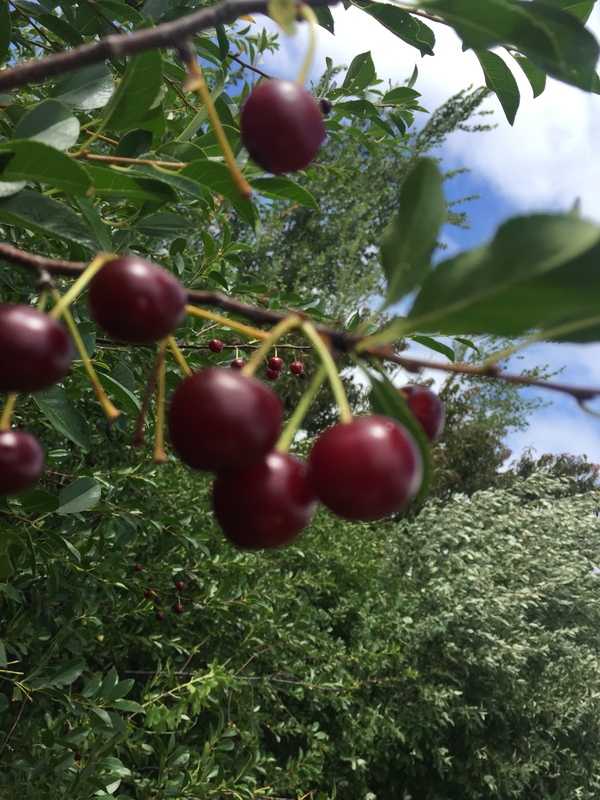 Sour cherries are very soft. 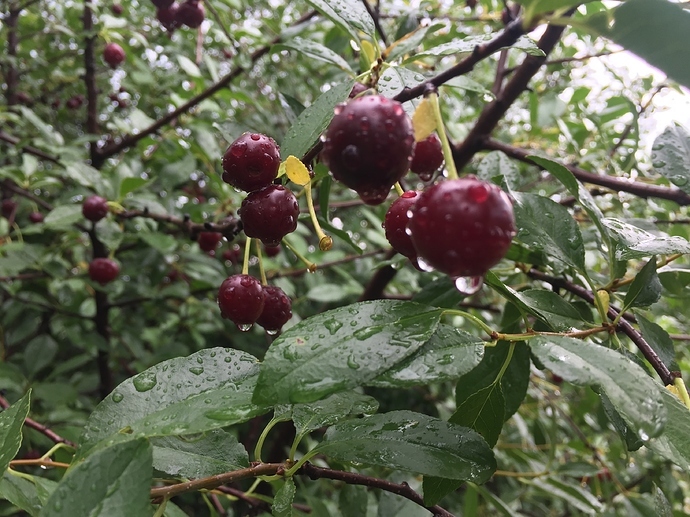 How long do you let your cherries hand on the tree after turning red? 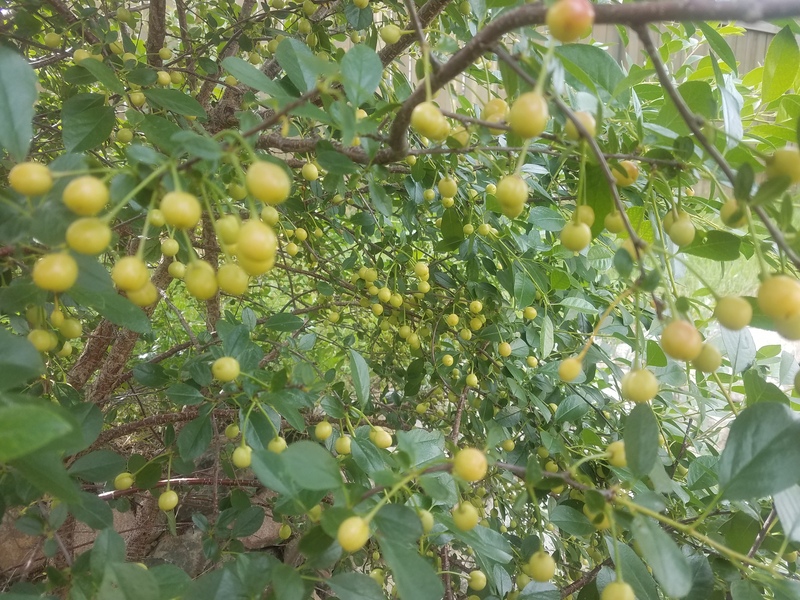 My Juliet cherries have been on the tree about a week, and I still think they’re way too sour to eat fresh. Let the carmine jewell sweeten up as long as possible (maybe a week or two).i keep all the animals and birds distracted with mulberries. 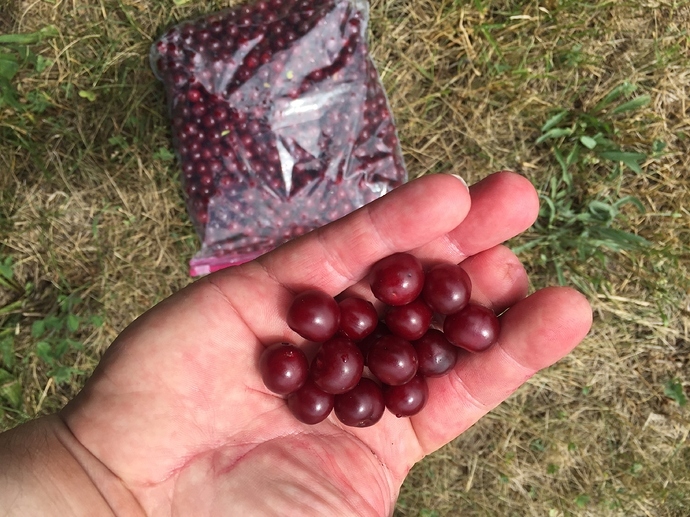 Mulberries lay on the ground so they are easy picking for animals. I can then pick my juneberries and cherries at my leisure. 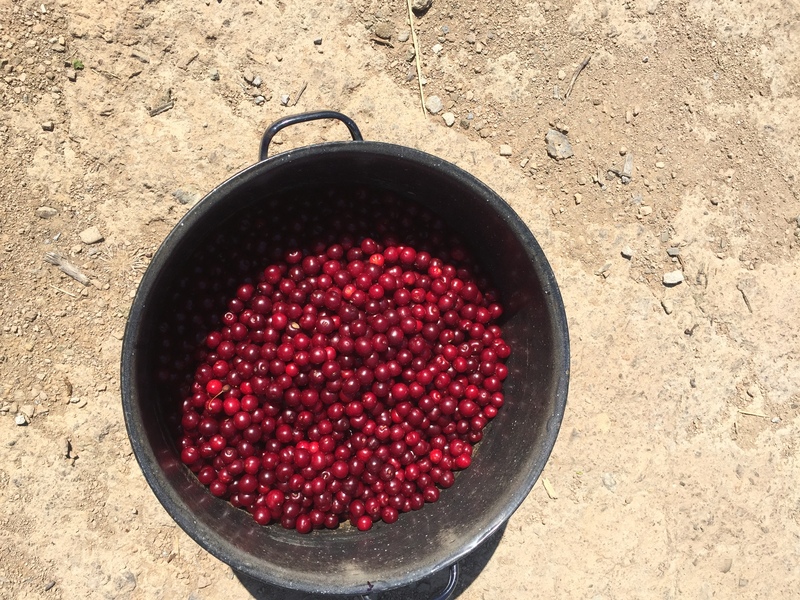 We are picking more Carmine Jewell this morning. You can see they are not all black but against that black 3 gallon canner the color is fairly dark. These will be used for making juice. 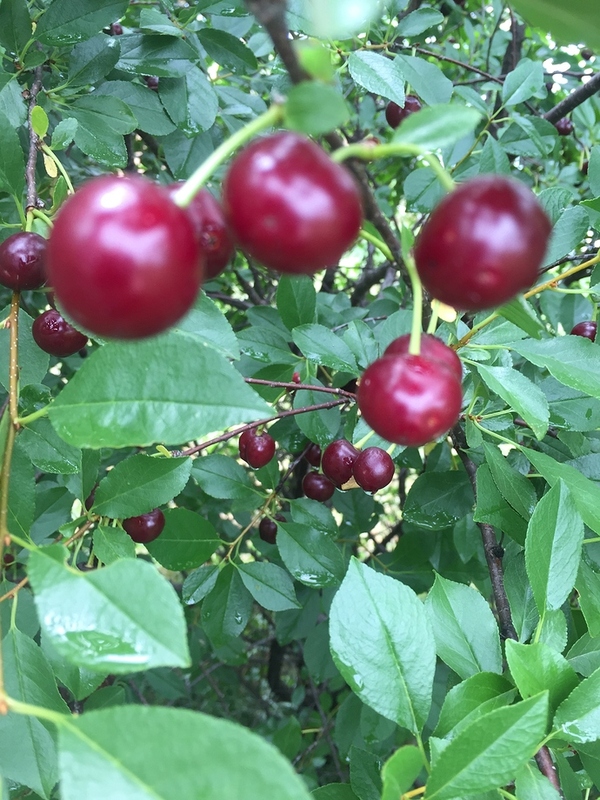 To me, they were darker in real life than what the picture shows and were 18 brix which I think is pretty high for a tart cherry. They weren’t as firm as I thought they would be based on some descriptions. 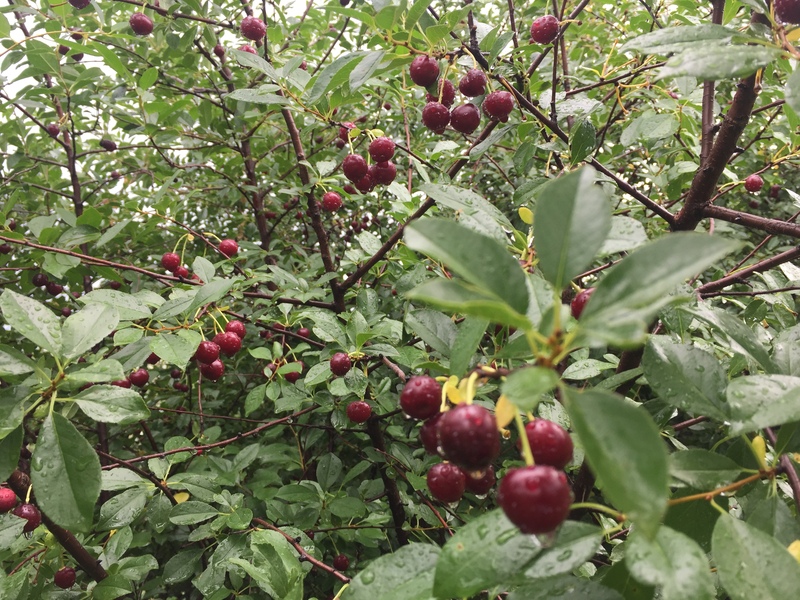 They were soft, juicy and about as good as a tart cherry gets for fresh eating. 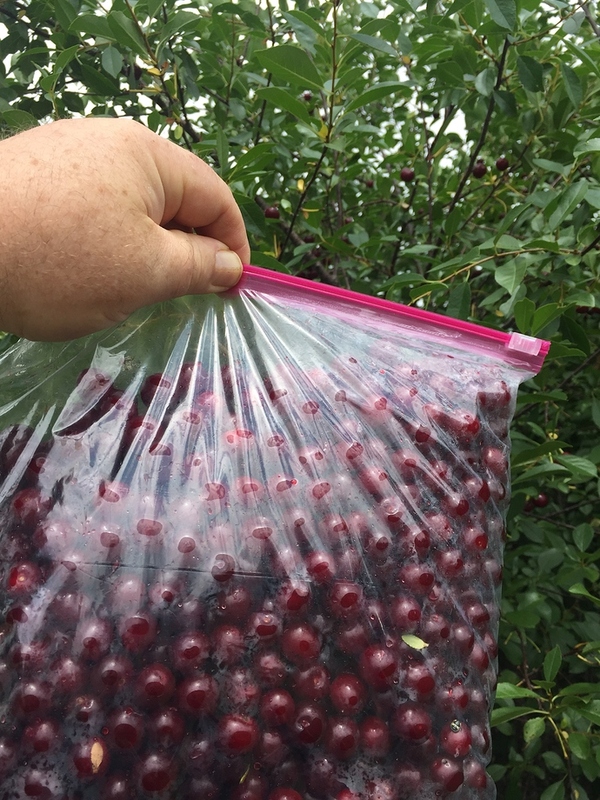 I would say they were similar to Carmine Jewel but a little bit earlier, bigger and tasted maybe just a smidgeon better, but I only got a handful off of a three year old graft. My Carmines are almost ready, I’ll probably pick them in 3 or 4 days. Hope the net stays on. When carmine jewell are close to ready the color darkens up significantly. These are actually ripe. Thanks for that comparison, Jublieum was one I was thinking about trying. Did you graft it onto your CJ? 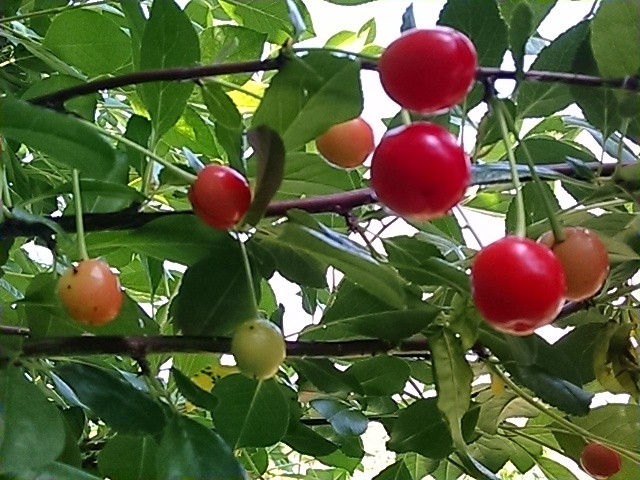 No, I grafted it onto a Surefire tart cherry tree. I kept the lower Surefire branches, then top worked it with a Jubileum graft. It has grown very fast in a few years. I really enjoyed them fresh, I just don’t know how heavy they will bear. All my Lapins sweet cherries brown rotted…all of them…i stripped the tree. My Carmine Jewel have shown no rot yet…and they are turning a dark red at this point. 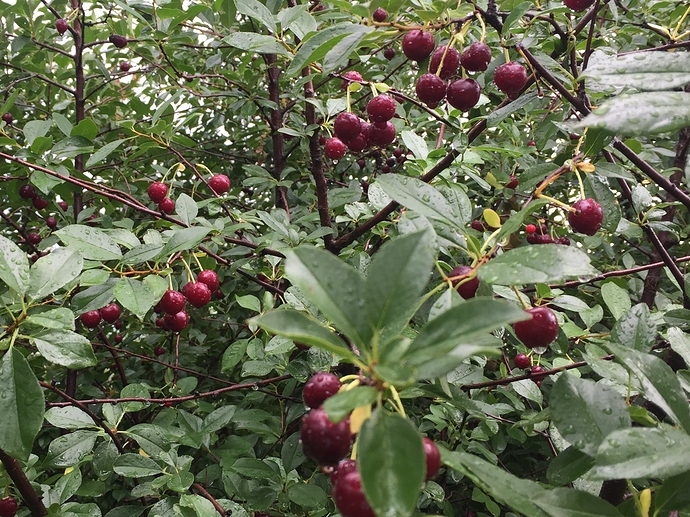 Birds are getting them too… taste is pretty good…not sweet cherry good, but good enough. We got torrential rain the last 4 days and more are coming. I had to pick all the remaining sweet cherries. I felt sorry for the out of town folks watching the CWS in Omaha. Indar works great on brown rot, and other funguses too like cherry leaf spot. It’s about the cheapest spray in my arsonal. You should have got in on the indar buy. Maybe try it on the next one. It works good on all the fruit trees. We got torrential rain the last 4 days and more are coming. And while the color is slightly darker than the pix, they’re clearly not what I prefer to pick. I hope my CJ harvest isn’t a bust, they’re loaded and drooping to the ground. Every time I get cherry rain crack I wanna go give my ER a big ol’ hug - that big fella hasn’t EVER had a cherry rain crack!! I would love to know the difference in taste between sour cherry ‘Montmorency’ and Crimson Jewel Jam. But on years when the fruit ripens under hot and dry conditions it’s very good. In optimal conditions it just a very subjective thing in terms of what one likes in a cherry, taste-wise. 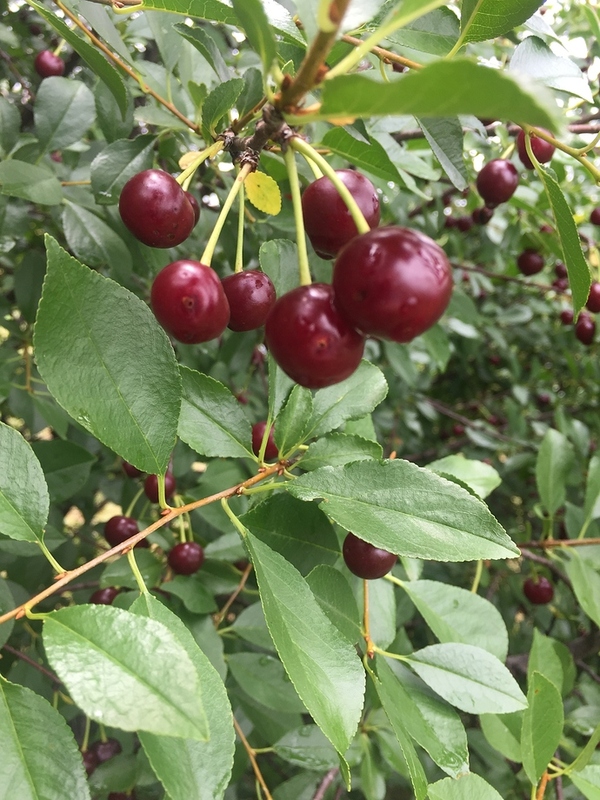 In my view, the Monty style cherries have a much more pronounced/strong cherry flavor that is accompanied with a distinct aroma. A couple characteristics that I find lacking in the CJ. The ease of harvesting and spraying of the bush cherries is worth a lot though, and the color of the jam made with ripe CJ’s is a real winner! I have a few on my two Juliet bushes that I should get to sample soon. Really looking forward to that! Carmine jewell taste very “cherry like” here in Kansas. They have been incredible this year! I think of ideal cherries as sour but some people think of cherries as sweet. 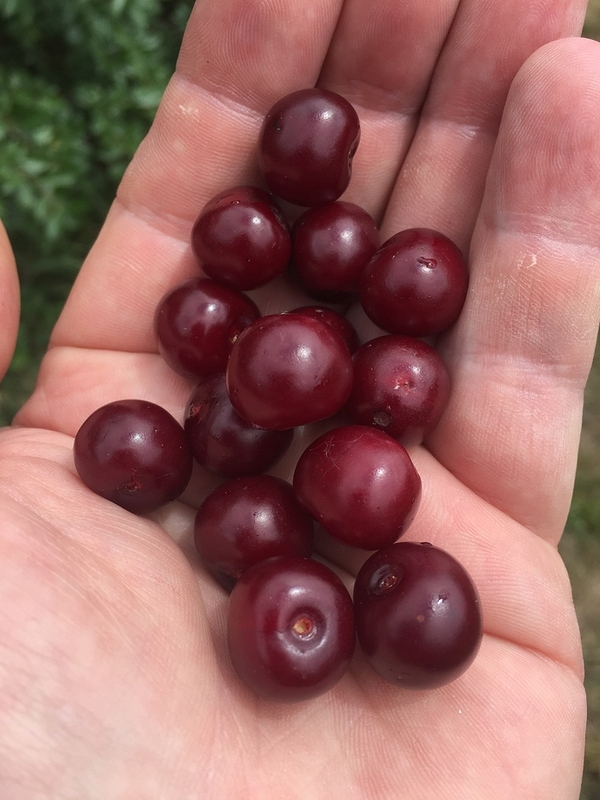 They are more Tart than cherry tasting but in pie everyone who has tried them preferred them to montmorency besides those of us who made the pie and pitted them by hand! I think of montmorency as being king of pie cherries because of all their characteristics but guests loved carmine jewell every time more. I love CJ for juice only! Nice pic, Im stealing it! Be my guest @TheDerek I just took that picture. 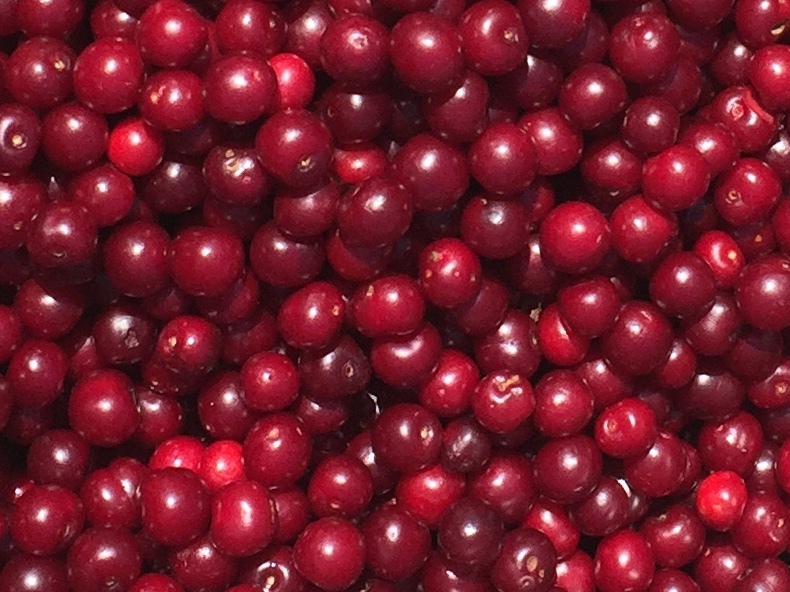 The CJ jewell cherries are not at their best until they look at least that darker color like in that photo. 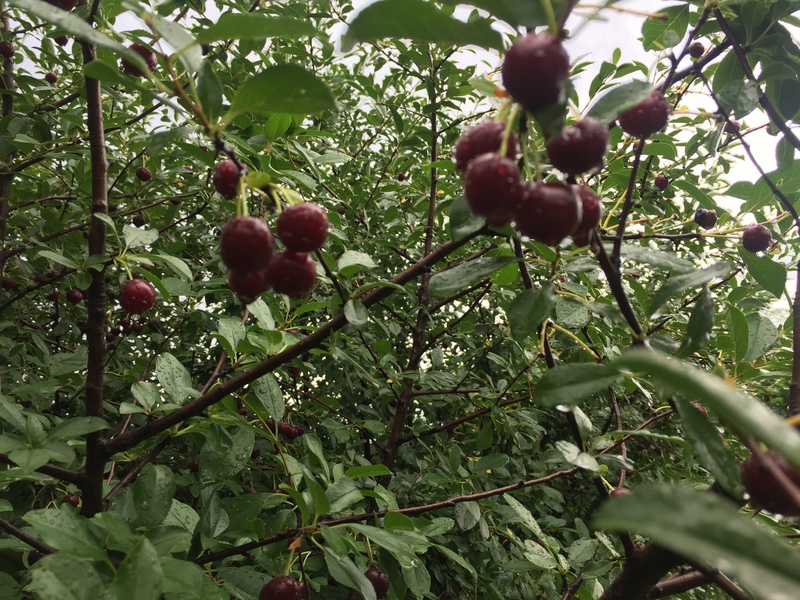 Many times when people don’t like them or if they are not cherry flavored enough they are not quite ripe.